Posted on November 8, 2016 by Philip O'Hanlon. Philip…started us off on Sunday with a Sibelius Piano Trio, the piano sound resonant, percussive, and rich in tone, beautiful. Then we listened to an unreleased rehearsal take of Ivan Fischer leading the Budapest Festival Orchestra playing Mahler’s Symphony No. 3, a simultaneous, alternate recording by Tom Caulfield only using five microphones, mixed down to two for stereo, the raw file without compression…This is the presentation that had me call this system the best orchestral reproduction at the show, wow. Strings and woodwinds outside the speakers by 15 feet, and the huge bass drum coming 40 feet behind the front wall seemingly from the next room. The dynamics were scary, the midrange glorious, it was powerful and involving, well done…This room was one of the very finest at the show. 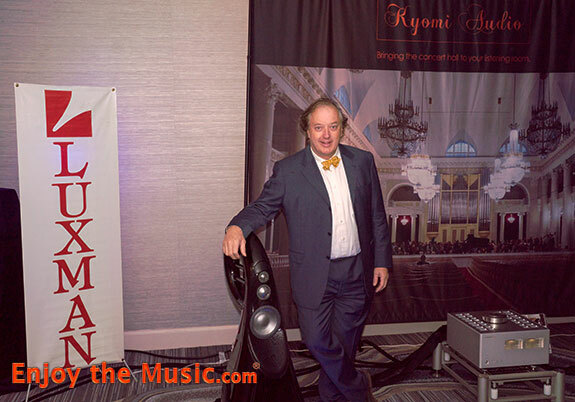 Read enjoythemusic.com’s full RMAF 2016 show report. This entry was posted in Press and tagged EnjoyTheMusic.com, RMAF. “Whole Lotta Love”, now that’s just one great song.